First of all we would like to inform you that we are authorized sale point (by local exclusive distributor for Pakistan) of Defibtech in Pakistan. The Defibtech Lifeline® View AED is the first and only Automated External Defibrillator (AED) that shows you what to do in an emergency, using the full power and clarity of video in full-motion color. They say a picture is worth a thousand words; video is worth even more. It just got even easier to help save a life. Mere seconds can mean the difference between life and death. Defibtech is an eye-catching AED (Automatic External Defibrillator) that can be located instantly. One that can be carried to the patient quickly without fumbling. One that can be used with minimal steps to analyze and treat the patient’s condition. From the moment someone suffers sudden cardiac arrest the inspired design features of the Lifeline AED (Automatic External Defibrillator) save precious seconds off the defibrillation process. Seconds that save lives. Now there is something you can do to improve the odds dramatically for your customers and employees with a solution that is easy to use and inexpensive to buy. Automated External Defibrillators (AEDs) are life-saving solution. Extremely cost-effective for tight budgets. Low life-cycle cost of ownership. Excellent dust and water protection. Durability for harsh environments and rapid deployment. Compact and self-contained to save much-needed space in a vehicle. Light and portable for easy transport in an emergency. Only defibrillation waveform with a Class IIa rating from the American Heart Association. With bright yellow and black coloring and attractive, sleek curves, the non-intimidating Defibtech AEDs (Automatic External Defibrillators) invite prominent display anywhere. The biphasic defibrillation we use is extremely effective at defibrillating patients in ventricular fibrillation – the most common form of Sudden Cardiac Arrest- on the first shock. At just about 4 pounds a child could carry them. Plus, Defibtech AEDs (Automatic External Defibrillators) meet US Military “drop and shock” specifications. Do visit our AED Implementation Program page for more details on this. 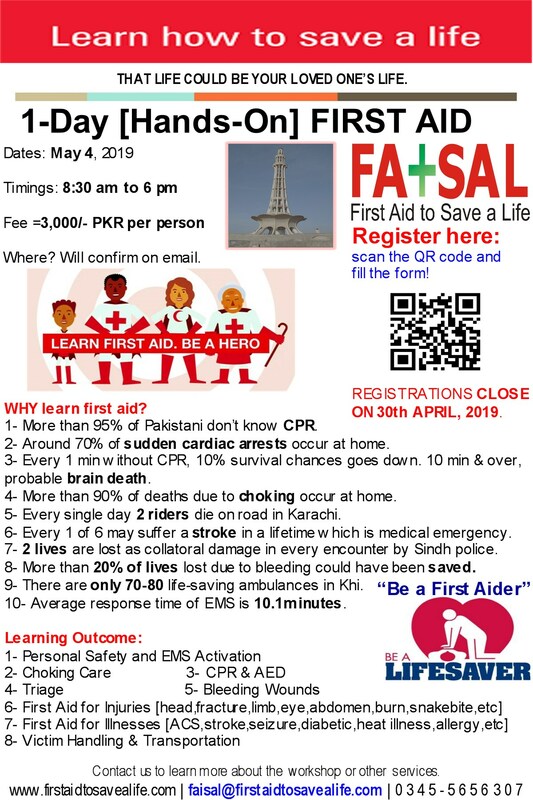 This entry was posted in Advanced First Aid, Basic First Aid, CPR and AED, First Aid, First Aid and CPR, First Aid CPR and AED, First Aid Training Programs and tagged aed training programs, automated external defibrillator, defibtech aed, Defibtech Lifeline AED, Defibtech Lifeline® View AED, official partner of defibtech in pakistan, sub-distributor of defibtech in pakistan, sudden cardiac arrest, use of aed. Bookmark the permalink. I love this product because most people would not know how to use an AED even if the facility had one. They should make all AED’s like this.